“Promise” is a stunning 7/8ths Arabian palomino stallion with good conformation and a look-at-me disposition! And people DO look at him! He turns eyes wherever he goes and is the “eye candy” for visitors to the ranch. 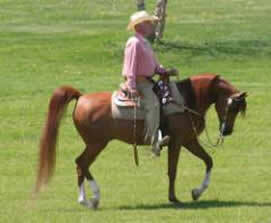 Trained as a fancy western pleasure show horse, he glistens under saddle and has a beautiful long-legged smooth lope. 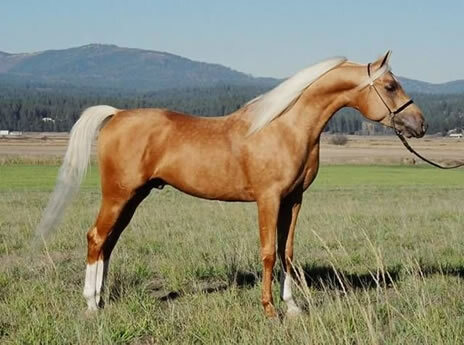 With his deep, copper, palomino color, solid conformation and long legged style, Promise is one of the most beautiful Arabian palomino breeding stallions in the US today. With his inquisitive nature and Arabian intelligence, Promise is our constant ranch joker and the one who is always into something or figuring his way out of something! 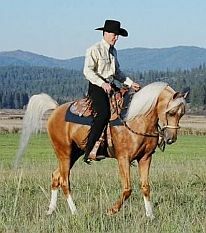 A western pleasure champion and reserve champion, Promise has a pedigree full of horses with a tradition of success both in the US and internationally. From Bey Shah, El Nahr HCF and Alada Baskin on his sire’s side to Bask, Fadjur, Ravel and Bolero on his dam side he was bred to perform and win. 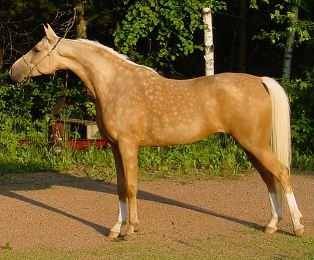 His foals have carried on the palomino color, long legged style and good conformation of their sire. Good As Gold II, has been an outstanding broodmare for Providence Farm in WI, known as one of the premier breeders of palomino half Arabs in the US. A halter winner she has also shown Western, Hunt and Dressage besides just loving a good ride out on the trails.